#1 is gauge and valve fitting. 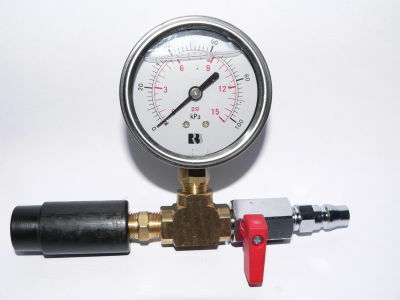 #3 is the universal gauge, with compressor fittings, a quick convert air coupling, and 4 quick convert adaptors, to suit any brand of IRB. The quick connect fittings allow for ease of changing from inflating one brand of IRB to another in only a few seconds. Some clubs own three different brands of IRB, so this was a popular choice of inflation gauge. Midcoast Marine design and manufacture inflation fittings to suit any brand of boat valve.